Trusting a person again who have broken it once is like putting your hand in the mouth of lion and expecting him not to bite it. 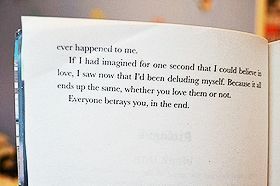 Nothing feels as bad as being betrayed by a single person you've thought would never speak a lie to you. It hurts a lot when you trust someone blindly, and that someone proves that you are actually blind! When someone breaks your trust don't feel stupid for trusting them. You didn't do anything wrong they're just an untrustworthy person. 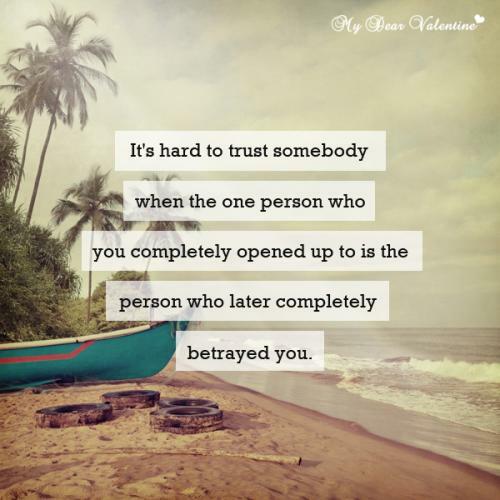 It's hard to trust somebody when the one person who you completely opened up to is the person who later completely betrayed you. Some people are afraid of getting committed, not because they can't believe someone... but because they can't forget the time they had believed someone truly. Its a shame that the very people who you protect are the first ones to turn there backs on you. Being betrayed is a form of dishonesty or disloyalty that may come in many different shapes or forms. Sometimes being betrayed may consist of being cheated on by someone with whom you are in a serious committed relationship with. While other times being betrayed might mean that a person chooses to be loyal to someone else over you when in fact they had a covenant or promise to be loyal to you before anyone else. Being betrayed can cause one of the worst emotional meltdowns that a person can ever experience, because when you put your heart and your all into someone or something and they show a lack and utter disrespect for the hard work and love you put in, it feels as though you have been robbed, and left with nothing. When a person has been betrayed it is important for them to forgive, and to move on. Holding on to grudges and anger will do nothing but stop you from living the rest of your life as you should, in peace.